Display your stunted emotional growth with a plastic partition designed for use on plane seats. 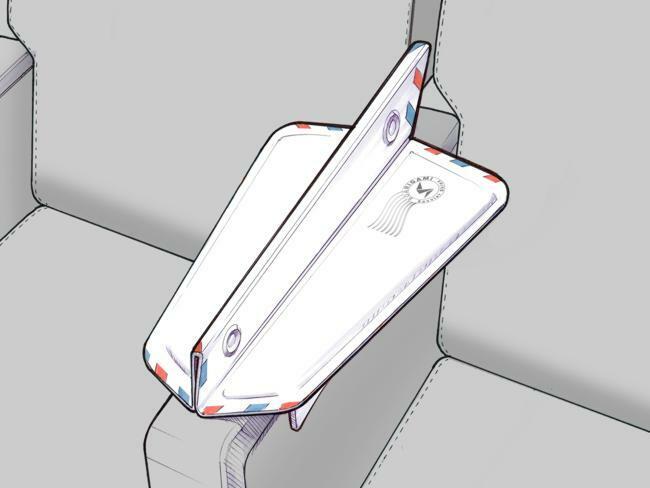 The new Soarigami Airmail Edition is a foldable device that splits your part of the armrest from the side that belongs to the stranger next to you. The thing doesn’t exist yet, but Soarigami has lots of pictures and promises it will come to fruition in early 2015. You can put your email address on a pre-buy list to be the first entitled jackass to get one. Here’s how it works: First, decide in your mind that one side of the armrest is yours and no one can touch it. Next, unfold the thin patent-pending divider and attach it to the armrest. Protect your territory from intruders as if you were an animal and not an adult person. Enjoy your flight. According to the product’s website, the Soarigami fosters sharing and fairness. But setting up a tiny barricade on a plane seat doesn’t seem like the neighborly thing to do. Remember when you were a kid and you would lose it when your little brother extended an elbow over the imaginary demarcation line on the back seat of the car? This is pretty much the same thing. But you’re not a child anymore. No one needs to act like a urine-marking wildebeest on a commercial flight. Have we forgotten how to function as social beings in shared spaces? There are so many public areas in which common armrests are a thing. If you’ve seen a movie in a theater or gone to a concert or watched a game in a stadium, you’ve probably encountered a shared armrest in the wild. Everyone knows how to deal with this situation. Put your arm on the armrest if it’s available. Try not to poke your elbow too much into the space of the adjoining seat. That’s it. Simple. No one gets in armrest fights in movie theaters. Why do we scrap basic interpersonal skills when we’re on airplanes? Is some guy’s elbow on your half of the armrest? Maybe don’t use a passive aggressive foldable partition. Maybe let it go. Or maybe politely ask him to move his arm. Would you use the Soarigami? Can You Outsmart Jet Lag with an App?